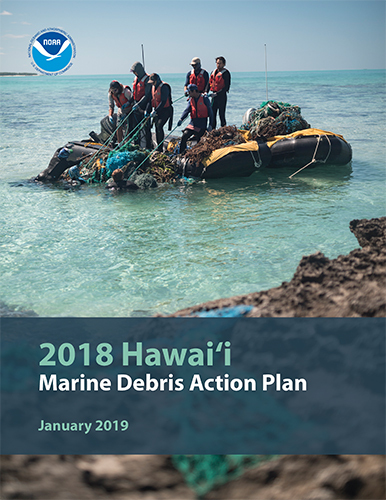 FEBRUARY 8, 2019 — On January 31, the Marine Debris Program (MDP) released the fifth and final revision of the Hawai‘i Marine Debris Action Plan. This document is the result of a productive and collaborative effort between the MDP and regional partners, including representatives from governments, non-profits, academia, and the private sector. Hawai‘i’s Action Plan was the first created in the country. Today, action plans across the United States are in various stages of creation and implementation. The purpose of the Action Plan is to reduce the ecological, health and safety, and economic impacts of marine debris in Hawai‘i by 2020. It serves as a coordinating tool by identifying partners’ shared goals, strategies to achieve those goals, and corresponding actions. The MDP solicited stakeholder input on the Action Plan through a two-day workshop, attended by 36 partner organizations. Partners committed to a total of 120 actions, both ongoing and new. The MDP will support partners’ actions by tracking progress, identifying gaps and potential solutions, and sharing relevant news and resources. For additional information, contact Mark.Manuel@noaa.gov.